AZTech Training is all about ensuring that our delegates get Quality Assured Training and this commitment to delivering the best possible learning experience is demonstrated by our continuous working relationship with 12 of the world’s leading professional governing and certifying bodies. We take strength from our network of more than 200 experienced professionals who provides us extensive knowledge of the private industry, business and government enterprises allowing us to develop industry-leading comprehensive training courses and seminars. AZTech strives to provide the best learning setting possible, as such, we have hand-picked 33 exciting venues worldwide where our delegates can fully immerse themselves and enhance the overall learning experience. 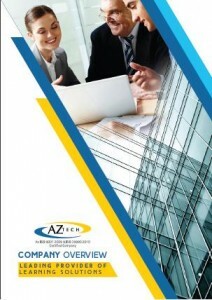 AZTech over the years has nurtured a vast network of experienced international consultants with extensive industry experience who have held executive and management positions. The team incorporates an outstanding academic background with professional strength and maturity when delivering a public seminar. For consultancy or in-company knowledge transfer, the real world business experience provides insight and understanding of the cultural and organizational difficulties related to sustainable performance and business development.